The Church of Nossa Senhora do Rosario stood on this site in the 15th century. In 1635-37, a Franciscan monastery was constructed on the property. Life wasn’t peaceful for long. 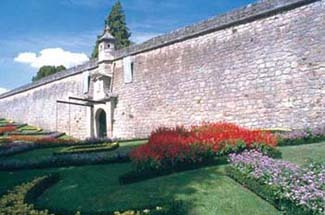 The Portuguese Restoration War (fought between Spain and Portugal over the accession of Jo‹o IV in 1640) led to thick fortified walls being built around the convent, essentially turning it into a military fortress. Monks and soldiers now lived side by side. The fortress later played a strategic role during the Peninsular Wars. From the 19th century until 1950, when the property was abandoned, a military barracks and hospital stood on the site. In 1997, it opened its gates as a hotel. This hotel makes a great base from which to explore a relatively undiscovered corner of Portugal. Just south of the Spanish border, it’s easy to continue on into Galicia. If you want a more spacious room, opt for one in the new annex. Chaves is located where the N-2 and N-103 highways come together, 10 km south of the Spanish border. The hotel is on a hill above the town. Buses connect to Bragana, Braga, Porto, and Coimbra. Nearby: horseback riding; wine tasting; thermal spa; hiking; Chaves historical center with Roman bridge and castle keep. Through the imposing walls of this fortress-convent, with its commanding position above the town of Chaves, you’ll find yourself surrounded by extensive gardens and courtyards. Within these gardens, the hotel is actually in two buildings, the original convent, which holds the church and some guestrooms, and a new and connected annex, which holds the larger guestrooms. Entry into the hotel is through the church portal. Guestrooms are modern in style and comforts, although some are furnished with antique reproductions. The restaurant offers elegant dining with a view. Regional selections include variations of seafood. For lighter meals you can try the fort’s tavern, decorated with the tasty smoked sausages traditional to the area. The hotel even holds a disco-bar. Be sure to make time for the swimming pool. Its built right against the convent ruins and has a terrific view over the countryside.